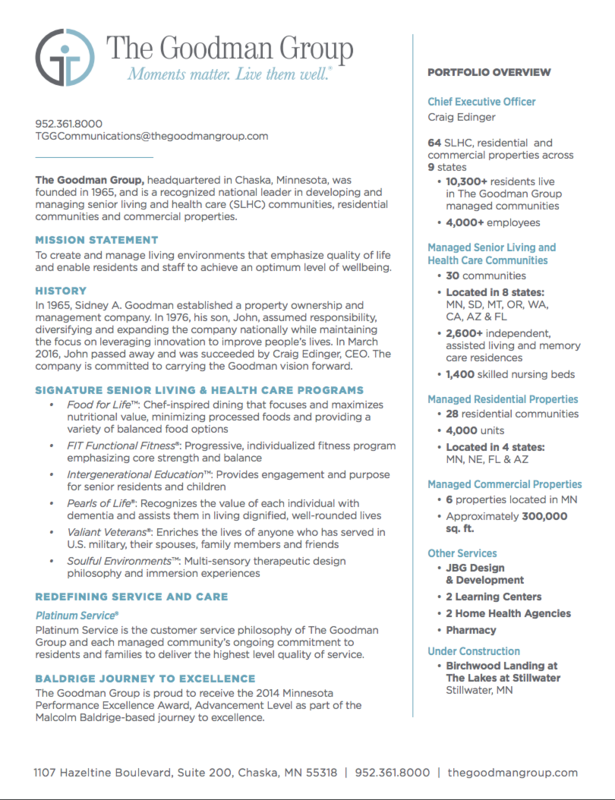 MINNEAPOLIS, Minn. (July 3, 2017) – The Goodman Group, a national leader in developing and managing senior living and health care communities, today announced that five of its managed communities received the Excellence in Action award from National Research Corporation Health. This honor, awarded exclusively to NRC Health clients, recognizes post-acute care communities that achieve the highest overall resident or employee satisfaction scores. The database is the largest source of long-term care and senior living satisfaction metrics in the nation. Each Goodman Group managed community was the sole winner in their respective markets. Those recognized with the workforce satisfaction in assisted living award include Terracina Grand, Naples, Fla. and Summer Hill Assisted Living in Oak Harbor, Wash. Recipients of the customer satisfaction award in assisted living include The Commons on Marice in Eagan, Minn. and Katella Senior Living in Los Alamitos, Calif. The recipient of both the customer and workforce satisfaction awards is Westpark Village in Billings, Mont.